The conclusion of the Harry Potter saga is as much of a cinematic event as it was a literary one when J.K. Rowling’s eagerly-awaited seventh book, Harry Potter and the Deathly Hallows, was released in July 2007 and broke a myriad of records for book sales. The success of the Harry Potter franchise is quite astonishing: it is reportedly responsible for almost single-handedly revitalizing the children’s literature market, brought fantasy fiction out of geekdom and into the mainstream, and of course made Rowling herself a gazillionaire, thanks not only to the book sales but also to the spin off merchandise, theme park rides, and of course the movies and soundtracks based on her work. Harry Potter and the Deathly Hallows, the seventh film in the series, is again directed by David Yates, and features Daniel Radcliffe, Emma Watson and Rupert Grint as Harry, Hermione and Ron, the three protagonists of the saga. Picking up from the immediate aftermath of Dumbledore’s death and Voldemort’s rise to power at the end of the sixth film, Harry Potter and the Half-Blood Prince, Deathly Hallows sees Harry, Hermione and Ron leaving Hogwarts School of Witchcraft and Wizardry to search for and destroy the remaining horcruxes: pieces of Voldemort’s soul which were hidden inside everyday objects in an attempt to make himself immortal. With Voldemort having taken over Hogwarts and rekindled his reign of terror in the wizarding world, Harry and his friends essentially become fugitives, desperately trying to evade capture by Voldemort’s agents. Eventually Harry learns of the existence of the ‘deathly hallows’ of the title, a trio of exceptionally powerful magical objects which he believes will help swing the balance of power in his favor, and eventually defeat Voldemort once and for all. The film has been split into two parts, with Part II coming to theaters in the summer of 2011. Harry Potter and the Deathly Hallows boasts possibly the most impressive cast of British actors in any film in recent memory: alongside regulars Michael Gambon, Alan Rickman, Maggie Smith, Robbie Coltrane, Ralph Fiennes, Jason Isaacs, Helena Bonham-Carter, John Hurt, Brendan Gleeson, Jim Broadbent, Emma Thompson, Gary Oldman and David Thewlis, the new cast also manages to add such luminaries as Rhys Ifans, Jamie Campbell-Bower, Ciaran Hinds and Bill Nighy. Impressive indeed. One person not returning, however, is composer Nicholas Hooper, who decided to not to take the opportunity to score the finale. His place at the podium is taken by French composer Alexandre Desplat, whose status as one of the most in-demand composers working in the film industry today has now been well and truly cemented. 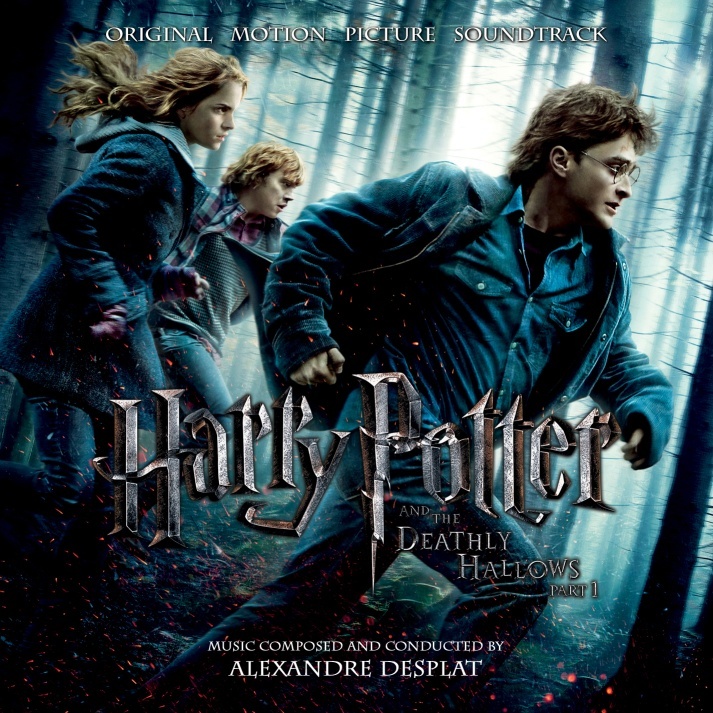 First things’s first: like Nick Hooper before him, and like Patrick Doyle before him, Desplat’s score does not make any obvious references to thematic material from the previous scores, with the exception of some brief lip service to John Williams’ famous theme, ”Hedwig’s Theme”, paid in a couple of the album’s cues. This will drive Williams fans insane, especially those who clamored for Williams to return to score the finale, but the point I made in my review of Hooper’s score for Harry Potter and the Half-Blood Prince last summer is still relevant here: the Harry Potter of Book 7 is not the Harry Potter of Book 1. He isn’t the wide eyed-innocent child at large in a new and fantastical world. He is a deeply troubled young adult, plagued by his past, surrounded by the death of his family and friends, weighed down by the pressures of an ancient prophecy, who must fight to the death to save the world which has embraced him as its savior. As such, it makes perfect sense that the flighty, whimsical nature of the first few scores has necessarily been supplanted by darker, more mature music. Owls, Quidditch games, and schoolyard rivalries are no longer Harry’s mains concerns, and so the music Williams wrote to accompany these things is naturally less important to the story. This is a story – and a score – about danger, anguish, regret, and sacrifice, and Desplat’s music inevitably reflects these things. Desplat’s music is fully orchestral and choral, performed with gusto by the London Symphony Orchestra and various choirs, alongside various specialist solo instruments ranging from the common (guitars, recorders) to the slightly unusual (a mandolin, a shakuhachi bamboo flute) to the downright peculiar, most notably a theorbo, which is a kind of a baroque long-necked lute. One thing I love about the score is that it is, in every way, a Desplat score: it features many of his personal stylistic trademarks, from the use of woodwinds as percussion, to the interpolation of a synth pulse to add more bass to certain sequences, the use of precise timpani rhythms, and specific phrasings in the string and brass writing which will be immediately recognizable to anyone who has followed Desplat’s career. I am very pleased that he has not been forced to supplant his musical identity in order to fit the needs of the film, and has instead tweaked it in the right direction of his own accord, adding only the necessary amounts of magic to the mix. The opening cue, “Obliviate”, gradually builds out of a see-sawing string motif to present a noble new theme for strings and solo cello, before entering the first of several high-drama sequences in which the orchestra stretches its legs: “Snape to Malfoy Manor”, despite clocking in at just under 2 minutes, presents a wonderful sense of darkness, foreboding and breathless energy. Different sections of the orchestra play off each other in bubbling counterpoint, underpinned by hooting bass clarinets, fluttering flutes, harp glissandi, almost subliminal gasps on the breathy shakuhachi, choral vocalizations, and a thrusting brass ostinato. It’s all quite wonderful. The film has a cool half-dozen knockout action sequences, beginning with the amazing “Sky Battle”, and running through later cues such as the tumultuous “Death Eaters”, the raucous “Fireplaces Escape”, and the cacophonous “Destroying the Locket”. Anyone familiar with Desplat’s action music from scores such as Firewall, The Golden Compass and The Ghost Writer from earlier this year will be thrilled by the dynamite string runs which leap up and down scales with boundless energy, which this time around are accompanied by all manner of orchestral mayhem and choral accents. “Sky Battle” features a wonderful string phrase underneath the action which sounds like a deconstructed, slightly off-kilter version of Hedwig’s theme, but which is quickly usurped by the vivacious, attention-grabbing orchestral performances that surround it. This cue, more than any other, should finally dispel the ludicrous myth that Desplat can only do pretty waltzes and can’t write more forceful material. “Ministry of Magic”, “Detonators” and “The Locket” are a clever trio of pieces which underscore Harry’s infiltration of the ministry to recover Regulus Black’s missing locket from Dolores Umbridge. “Ministry of Magic” is all brusque business, a busy and self-important sounding piece which razzle-dazzles with blustery marches and percussion runs, but which masks a darker inner core. The hooting woodwinds in “Detonators” seem to have the same sense of twinkling tomfoolery that any self-respecting Weasley product would have, although the thunderous timpani hits and subsequent string-led lament hint at the inherent danger of the situation. “The Locket” itself revisits the slightly saccharine sound Hooper gave the Umbridge character in The Order of the Phoenix, although this time her true nature is subtly revealed by making her motif snaky, slithery, and more than a little deceitful. The music for the sequence in which Harry and Hermione visit his childhood home in Godric’s Hollow, which includes “The Exodus”, “Godric’s Hollow Graveyard” and “Bathilda Bagshot”, is the closet the Potter music has come to all-out horror. “The Exodus” is a tormented piece for a detuned violin, ominous clarinet accents, and portentous string chords, emphasizing the danger about to overwhelm the friends. “Godric’s Hollow Graveyard” is filled with a palpable sense of sadness as Harry finally visits his parents’ grave: the solo cello motif and the mandolin accents combined with the warm, bittersweet string theme gives the whole sequence an attractive-yet-melancholy tone, while the piano echoes give the scene a cold, wintry overtone. Things come to a head in “Bathilda Bagshot”, which layers tension upon tension upon tension, exacerbated by anxious blasts on the shakuhachi wood flute (one of James Horner’s favorite colors), before exploding into a powerful sequence of tremendous orchestral savagery at the cue’s end. “Captured and Tortured” features some stark, unnerving synth elements and thunderous percussion writing, which pounds and pummels away before turning into another dark lament for brooding strings and wailing woodwinds. It eventually explodes into the score’s final action sequence, “Rescuing Hermione”, which is replete with more rapid-fire string runs and effortless energy. At the other end of the scale, a warm and noble new brass theme for the Order of the Phoenix opens “Polyjuice Potion”, before heading off into a series of light and whimsical sequences featuring prominent woodwinds and glittering chimes which retain a brief semblance of the magic and mischief of previous scores. It’s the last time there will be any magic or mischief for a while. The only cue which comes close to returning to that style is “Lovegood”, the cue for Harry’s encounter with the duplicitous Xenophilius Lovegood, whose revelations about the nature of the Hallows set Harry on his quest. Lovegood’s music is slightly peculiar and a little exotic, mixing all manner of shaking and rattling percussion, ragged bass flutes, and an uptempo main theme to illustrate an important, if a little deranged, character. It’s slightly reminiscent of the music Desplat wrote for the equally offbeat Gyptians in The Golden Compass, but without their sense of fun and raucousness. Of the other cues of note, “The Will” is a textural piece full of mystery and uncertainty which features an ethereal choir offset by warm guitar chords and nervously trilling flutes, fondly remembering Dumbledore’s kindness, but tempering it with an unexpected sense of menace. Later, “Dobby” has his own little motif, a playful dance for mandolins, the aforementioned theorbo, and light percussion gongs which encapsulate his impish nature, and which builds up a surprising head of steam as it develops. There are also several moments of great emotional pathos. “At the Burrow” has a beautiful sense of longing, especially in the moments when a solo horn takes center stage, and maintains a defiantly tragic feeling as the cue progresses, even when you think the strings are going to erupt into a large-scale romantic theme. The theme for “Harry and Ginny” is in no way straightforwardly romantic, touching instead on the sense of separation the pair feels when forced apart. Desplat’s piano performances in this cue reinforce this notion by remaining slightly unresolved and out of step; pretty, but in no way happy. The solo cello returns in the beautiful yet devastating “Ron Leaves”, which is about as dark and emotionally powerful as Harry Potter music ever gets. Later, “Ron’s Speech” revisits similar thematic material, but with a warmer, gentler aspect that speaks of fraternal friendship and resolve. The conclusive “Farewell to Dobby”, with its sorrowfully tender cello performance, makes me salivate at the prospect of the music Desplat may write for the overwhelming and harrowing finale of Part II. Possibly the only negative thing about Harry Potter and the Deathly Hallows is the lack of a single, identifying theme for the film in itself. Whereas Sorcerer’s Stone had a multitude of themes, Chamber of Secrets had “Fawkes the Phoenix”, Prisoner of Azkaban had “Window to the Past”, Goblet of Fire had “Harry in Winter”, and so on and so on, Deathly Hallows is a little on the anonymous side in terms of thematic memorability. Even Hedwig’s Theme, the singular defining musical motif of the entire series, features briefly in just three cues: “Polyjuice Potion”, “Sky Battle” and “The Will”, despite Desplat’s claim that he tried to incorporate the theme at regular intervals. Desplat’s musical ideas are all excellent, but none of them ever rise to the fore in the way one might have expected: this is a score of very good underscore, but you’re not going to hear it as a concert suite, and cinema-goers aren’t going to leave the theater whistling the main theme. This review of the soundtrack for Harry Potter and the Deathly Hallows Part I is of the regular release, which features 26 cues and runs for a generous 73 minutes. In addition to this, there are two additional releases: a limited edition bonus disc box set which includes six additional music cues (“Voldemort”, “Grimmauld Place”, “The Dumbledores”, “The Tale of the Three Brothers”, “Bellatrix” and “My Love Is Always Here”), and a deluxe digital album of the soundtrack which will include three more tracks outside of the 26 original, although it is currently unclear whether these are three of the six from the collector’s set. So, I’ve given yet another Alexandre Desplat score a five-star review, which I have no doubt will lead some readers to accuse me of bias, or predictability, or whatever other derogatory term crosses their mind. I make no secret of the fact that I honestly believe Desplat to be the most exciting musical voice to emerge in film music since the turn of the millennium, and for me Harry Potter and the Deathly Hallows Part I just reinforces that view. Irrespective of any complaints about thematic consistency with other films in the series, or the lack of a prominent main theme in this score, I honestly feel that this score is one of Desplat’s greatest achievements, and highlights everything I love about his work; the orchestral textures, the intricate use of unexpected instruments in unexpected settings, the crystal clarity of his orchestrations. But what this score has over others in his canon is emotion: unashamed, heart-on-sleeve emotion, which embraces the darkness of the story and runs with it, thrilling the listener with powerful action and forcing the listener to feel Harry’s pain with equal skill. For me, this is unquestionably one of the best scores of 2010, and I hope beyond hope that Desplat’s services are retained for Harry Potter and the Deathly Hallows Part II next summer. Music composed and conducted by Alexandre Desplat. Performed by The London Symphony Orchestra, London Voices, The London Oratory Junior Choir and the Schola Cantorum of the Cardinal Vaughan Memorial School. Orchestrations by Conrad Pope, Nan Schwartz, Clifford Tasner, Jean-Pascal Beintus and Alexandre Desplat. Featured musical soloists Paul Clarvis, Alison Stephens, Clive Bell, John Parricelli, Rebecca Gilliver, David Miller, Jakob Lindberg, Piers Adams, Jill Kemp, Annabel Knight and Alexandre Desplat. Special vocal performances by Katie Trethewey, Gabriella Kitto and Eoghan McNelis. Recorded and mixed by Peter Cobbin and Sam Okell. Edited by Gerard McCann, Peter Clarke, Allan Jenkins and Stuart Morton. Album produced by Alexandre Desplat and Conrad Pope. Out of curiosity, are you working from the 128k promo that’s been going around or from a higher-quality or lossless source? I don’t know anything about a 128k promo. My copy is a 192k digital version supplied by the label. A very good and thorough review. I am no fan of Desplat, but I am truly looking forward to this one. I wonder, though, why you act as if it’s an offensive affront that somebody says that you’re biased. If I were you, I would wear it as a badge of honor. You love most if not all of Desplat’s music, and there’s no shame in that! Honestly, though I am not his biggest fan, I can see why people love his music. The one thing that officially won me over to wanting to get this soundtrack is the fact that you say it has “heart-on-sleeve” emotion. That is the type of music I’ve always wanted Desplat to write, and if what you say is true then your statements of high praise just might hold true for me as well. Thank you, Jon, for a very informative review! You’re truly a gifted writer. My fvoarite character is Hermione. She’s clever and loyal and the boys would be lost without her. I am such a fan of Desplat’s work. His music has a flexibility to it that allows him to cover such a surprising range of emotions, and he presents them with such class and such cleverness that, as you say, his emotional work lends itself to some unexpected turns. From your descriptions, this sounds like yet another winner from one of the best emerging composers in the business. Great review. I agree, the problem is the thematic continuity (I was expecting to hear Hooper’s Umbridge theme) but, being honest, I don’t care anymore. I think this has become my favorite Desplat score. I love how faithful is of the book’s spirit, and makes me think that the movie it’s going to be the same thing. I also love the variety of styles of this score. It’s orchestral, choral, minimal, epic, restrained, emotional, quirky, funny, frightening. And conveys the spirit of the book perfectly. I’m really looking for the film, to hear the whole score and his function in the movie. And I really hope that if Williams can’t comeback, Desplat does. For me, he has written the sound of the end of the saga. Great and thorough review. You made me extremely eager to hear the album. Good stuff! John, could you upload your review of HP and the Goblet of fire? I’m trying to improve the article on Wikipedia about that score and I’d appreciate I you coul do it. I need all information and review’s on the score I can get. The review is now uploaded Luke!